Travelling around the world and experiencing the cultures of foreign countries is undoubtedly one of the chief bonuses of becoming an expat. While foreign cultures may often take time to adjust to, there is one element that is always easy to slot into, and is also a great way to get to know your new colleagues- drinking. Going out for drinks with new colleagues and co-workers is often used as an initiation method, and what better way to make new friends than over a nice drink. Most popular expat destinations are known for their strong drinking culture, apart from Muslim countries like the UAE, and unless you don’t drink then you can expect your initial social experiences to be bonding sessions over beers and cocktails. Of course drinking goes hand in hand with cuisine, and this is often reflected by the culture. 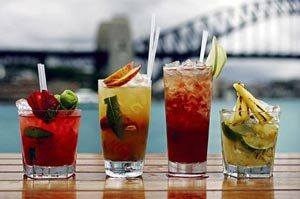 Travelling around the world you will have the pleasure of experiencing some fantastic exotic drinks. Let’s take a look at some famous exotic drinks that expats have enjoyed over the years. The Mojito is a favourite in bars and clubs around the world now, especially in the UK, and many variations also exist. The original Mojito hails from Cuba, and famous expat Ernest Hemingway was known to enjoy them with his expat friends in the La Bodeguita hotel. The Singapore Sling is a well-known drink created in Singapore at the beginning of the 20th century in the prestigious Raffles Hotel. Made with a blend fruit and liquors, the Singapore Sling was served exclusively to the high-class visitors of the hotel including expats like Rudyard Kipling and Somerset Maugham. The Gin and Tonic is a much-loved drink here in the UK, but did you know that it was actually invented by the British Army way back in the 18th century during their time in India. Interestingly, the drink was not made as an alcoholic drink but soldiers were urged to drink tonic water as it contained large amounts of quinine, a substance that helped keep soldiers free from malaria. The gin was simply added to balance out the horrid taste of quinine, and thus a timeless drink was born. The Pegu Club was another favourite of British expats from days of yore. Originating in Burma, the Pegu Club was created in the Rangoon club which catered exclusively to British gentlemen. The Pegu Club became very popular and was added into Harry Craddock’s legendary Savoy Cocktail Book.